On Friday or Saturday morning, you canenjoy Boston's lively outdoor market in Haymarket Square. On Sunday you can attend a service at Old North Church. Start: Faneuil Hall Marketplace (MBTA subway: Green Line to Government Center). Finish: USS Constitution ("Old Ironsides") in Charlestown. Time: 2 hours; more if you tour several buildings; the distance is about 2 miles (3.2 km). Best Time: Anytime; the open-air market is on Friday and Saturday; Old North Church has services Sunday morning. 2. 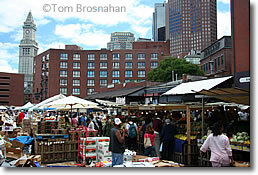 Haymarket, the name by which Boston's open-air produce market is generally known. Every Friday and Saturday, this area is thronged with costermongers selling fresh fruits and vegetables in Boston's weekly outdoor market. 5. Paul Revere House, 19 North Square (tel 617-523-2338), a small clapboard dwelling surrounded by crooked cobbled streets. It's the only house left in downtown Boston that was built in the 1600s. Paul Revere moved in about a century after the house was built, and he lived here during the Revolutionary period. The house would be interesting even if the great patriot had never set foot in it, with its quaint weathered exterior, small windows, and wide floorboards. But furnished in colonial style and admirably furnished with explanatory materials, the house is better than an hour's history lecture. 7. Old North Church, 193 Salem St.. (tel 617-523-6676). You can see by the church's location why it was a good place from which to give a signal. The code, as every schoolchild knows, was "one if by land, two if by sea," and it was two lanterns hung in the tower that started Paul Revere and William Dawes on their fateful night rides to warn the Colonials that British troops were heading out from Boston to search for hidden arms. Old North is the oldest church building in Boston (1723), and is today officially known as Christ Church, Episcopal. A walk around inside turns up many curiosities that bear on the history of Boston and the United States; memorial plaques to famous men, nameplates on the very high pews. The tall graceful windows of Old North Church are exceptionally fine. Although it's hemmed in by houses and shops on all sides, Old North Church does have a set of tiny terraces and gardens on its north side, open to the public. The satisfaction of a great number of spectators"
To commemorate the two events. The question that comes to mind: would it not have been faster to dispatch John Childs from the steeple to Lexington and Concord by air, rather than Dawes and Revere by land, on that historic night in 1775? 8. Copps Hill Burying Ground, the second oldest cemetery (1660) in the city. Among the cemetery's permanent inhabitants is fiery Puritan preacher Cotton Mather. Some of the tombstones were marked by British musket-balls during the revolution. You can visit daily from 9 am to 4 pm. While you're up on Copps Hill, look across to Bunker Hill, with its obelisk monument, and the old Charlestown Navy Yard to see the tall masts and complicated rigging of the USS Constitution. To reach the ship you must walk over a mile, across the Charlestown Bridge and to the right; you might want to take a taxi instead. 9. Bunker Hill The 200-foot granite obelisk which towers above Charlestown marks the spot where Colonel William Prescott of the Continental army stood with his small force and held off wave after wave of attack by British regulars on June 17, 1775. 10. USS Constitution ("Old Ironsides," tel 617-242-1797), still commissioned in the service of the US Navy. The ship still gets under way once a year, on the Fourth of July, when it's taken a short distance out into the harbor to fire a 21-gun salute. Sailors in 1812 period uniforms will take you through the ship and explain its workings to you free of charge. The nearby Museum (a private enterprise) houses many artifacts dealing with the Constitution's history and its 40 battles at sea (all won), besides a "Life at Sea" exhibit, showing what shipboard life was like in 1812. The Boston Navy Yard National Historic Site also offers programs on the yard and the American Revolution. Weekly open-air market on Friday and Saturday in Haymarket Square, Boston MA.